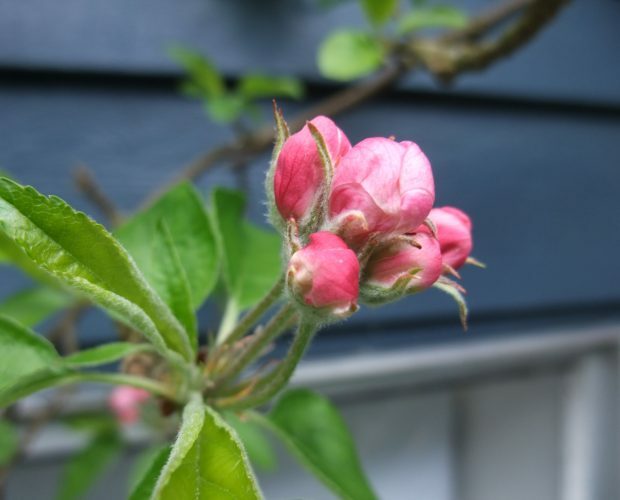 It is finally spring and my apple tree is blossoming! With mason bees flying around, everything is in sync. Orchardists assess bloom at different stages to give them a clue about blooming time and when bees are needed in the orchard. This slide shows some of these stages: pink and in tight cluster, pink and open cluster, King blossom in bloom, all flowers in cluster in bloom and petal drop. Once petal drop occurs, all possibilities of pollination are over. 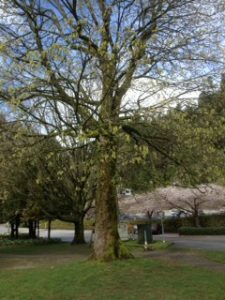 Note though that one tree has various stages of bloom at any one time, giving the bees the potential of reaching more flowers and giving us more fruit to harvest in the fall. Have a great spring- now that it is here! 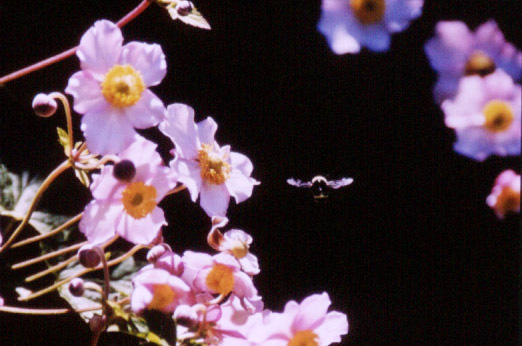 Bees depend on flowers for own survival and the survival of their offspring. 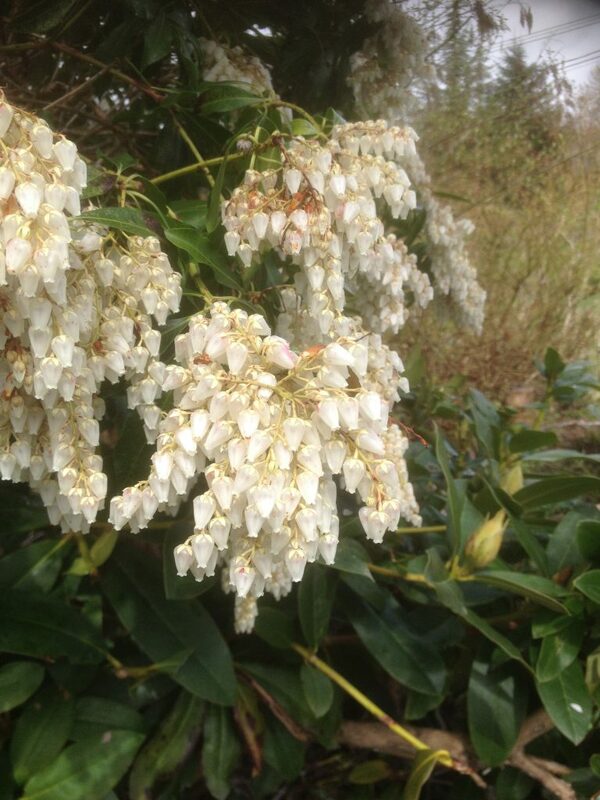 Pieris japonica is an amazing plant. 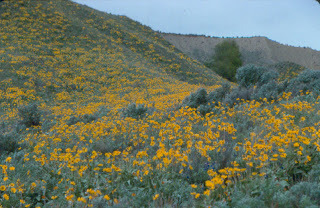 It is hardy, drought tolerant and when pruned after bloom, it produces a mass of flowers the following spring. A delicious scent tells bees there is food available. Nectar and pollen are available from flowers such as these. all bees are vegetarian and need pollen for their protein source and nectar for their source of energy. Go to your garden center and pick one of the many available varieties. 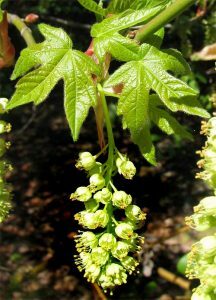 The Big Leaf Maple Acer macrophyllum of Coastal north America produces abundant flowers in spring. When in full bloom and if it is sunny it sounds like the whole tree is going to buzz off! 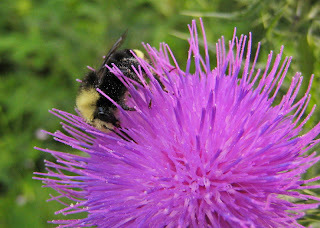 It is a great spring food source for bees. 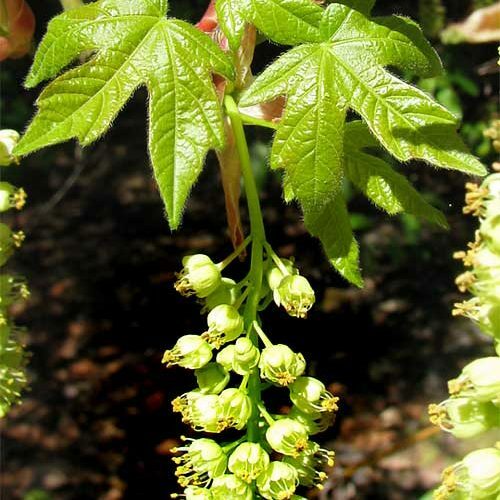 The close up picture is of another Acer spp. and also has lots of flowers for bee forage. 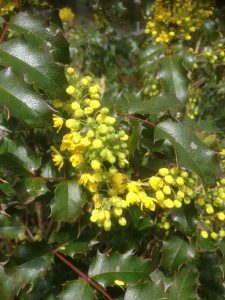 This is best shrub you can buy for Mason Bees. 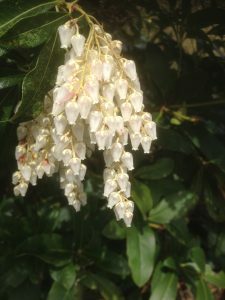 Pieris japonica. Prune every fall after bloom and blooms will abound. 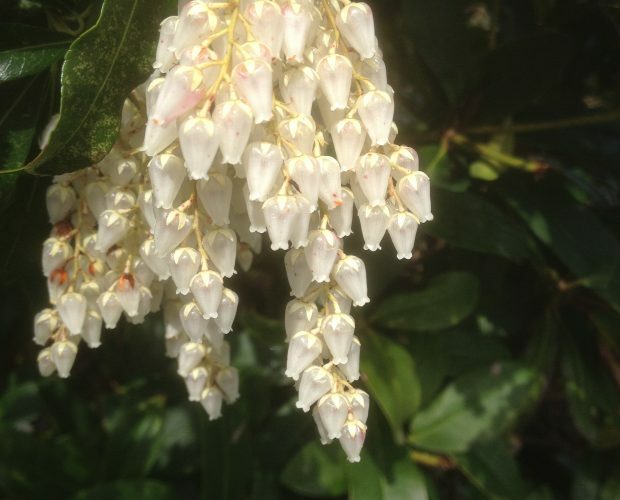 It blooms in early spring when mason bees are emerging. 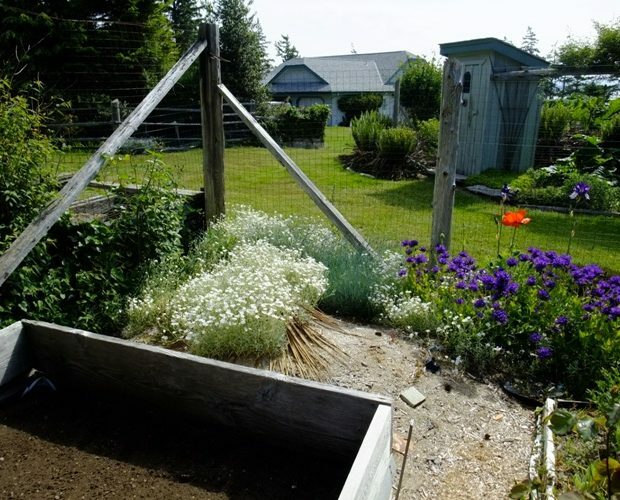 Ground covers a boon for hotty sunny weather and container gardening. 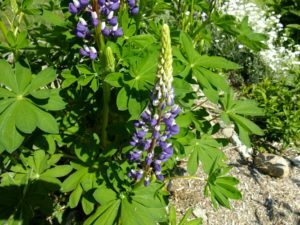 Lupines are a great summer plant . Lots of bee forage in these! Gardening for bees is a lot of fun. 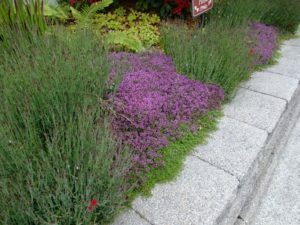 One way of creating space for bee attractive plants is to create an edge of plants adjacent to your lawns. Bees need food in the form of pollen and nectar. 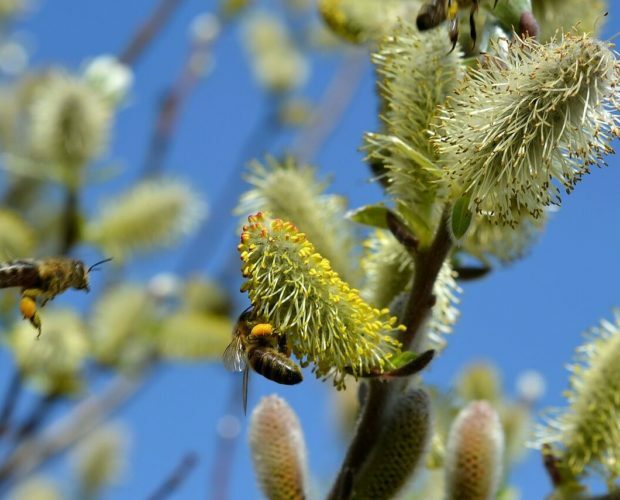 Therefore choose plants that are attractive to bees and that are suitable for your region. 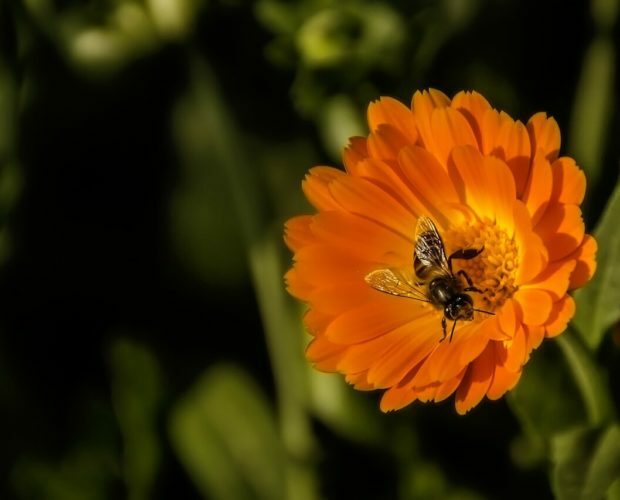 The ultimate is to have flowers blooming throughout the spring, summer and autumn because different species of bees abound at different times of the year. A great way to see what attract bees is to go to a nursery at different times of the year and see which plant are the most attractive to bees. It is a fun way to go shopping. Go shopping for garden plants on a sunny day. The mornings are usually the best time to do this. Have fun and send us your pictures. 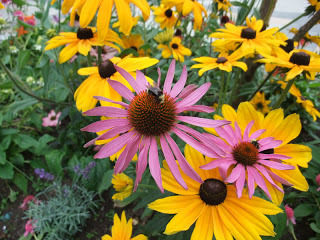 The bees will love your garden and they will come back every year for your enjoyment. 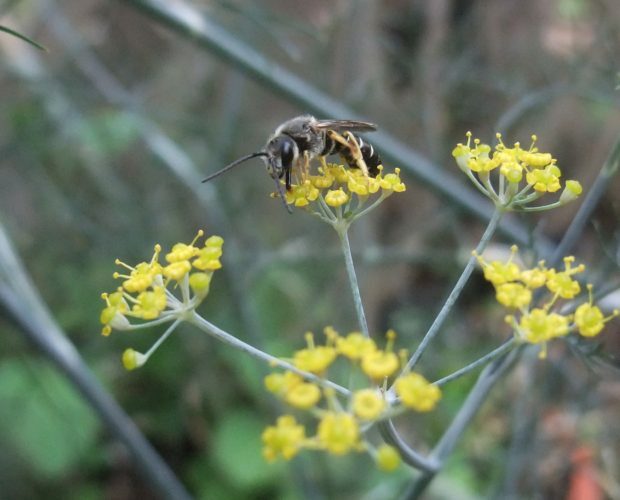 This is a great fact sheet on what to consider when gardening for bees. Link to fact sheet. I was showing my 9 year old grandson a trick or two about photography this summer. A little space goes a long way! For a long time, photography of flowers were a mystery to me until I learned that a black or dark background and low angled light (early morning or late evening or winter light) works rather well. It also works if the background is not distracting and adds to the story. A good camera and the right settings help as well of course. This yellow Anemone flowers all summer. This one found a tiny crack between the wall of my carport and asphalt driveway. The mauve Aster blooms in late summer and insects, in particular bees love it. 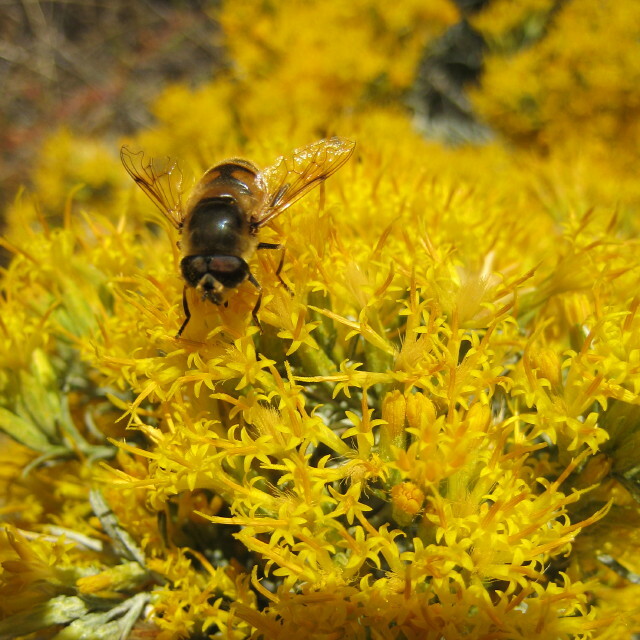 If it is watered regularly, nectar is produced, making it a very attractive plant for insects. Cropping this photo using Adobe would also help, but I have not mastered this yet! Thanks Sue -for sharing these great photos. Thanks Sue. They are great shots! 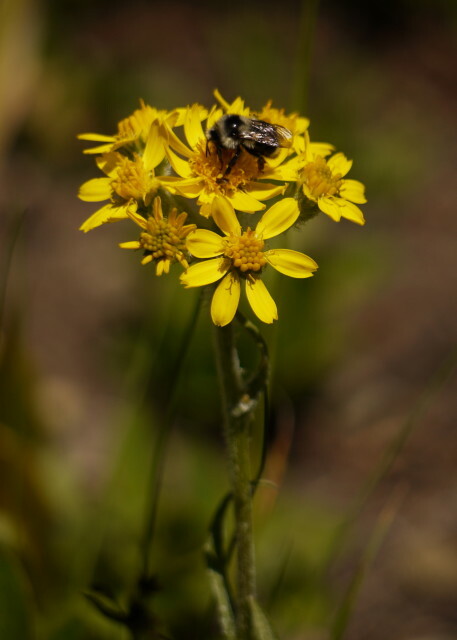 Bumble bee on Senecio spp. Fly ( no antennae) on a succulent. Bumble bee male ( yellowish head) on red clover. 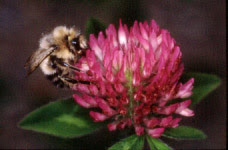 Clover is probably the most abundant and best producer of nectar available to bees within the city and into the suburbs. 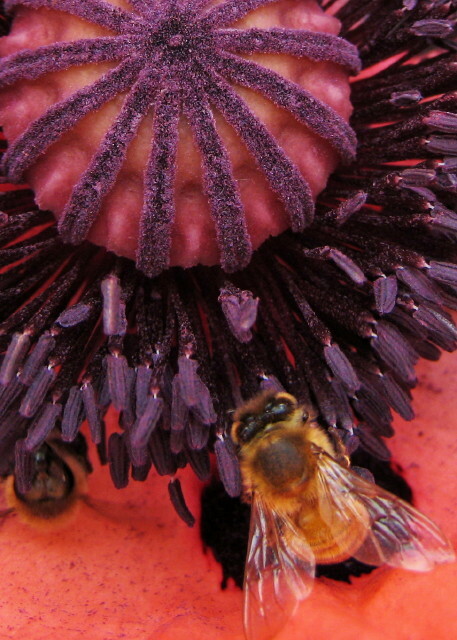 Of course blackberry is another great flower for bees since it also produces lots of nectar. July- Mason Bees are still flying. What is so neat about these bees flying into July is that they are flying and nesting in a nectar and pollen rich time period. 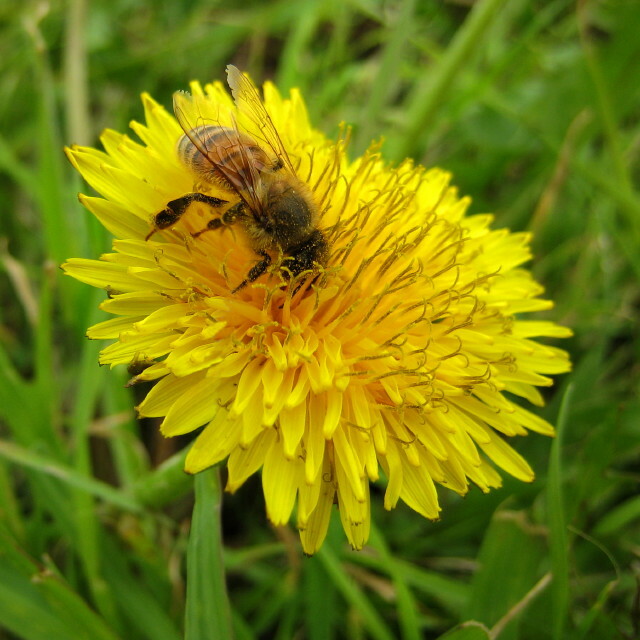 As a beekeeper we know that spring is a time when nectar and pollen is abundant for nesting. This period is followed June, which is usually a dearth period. 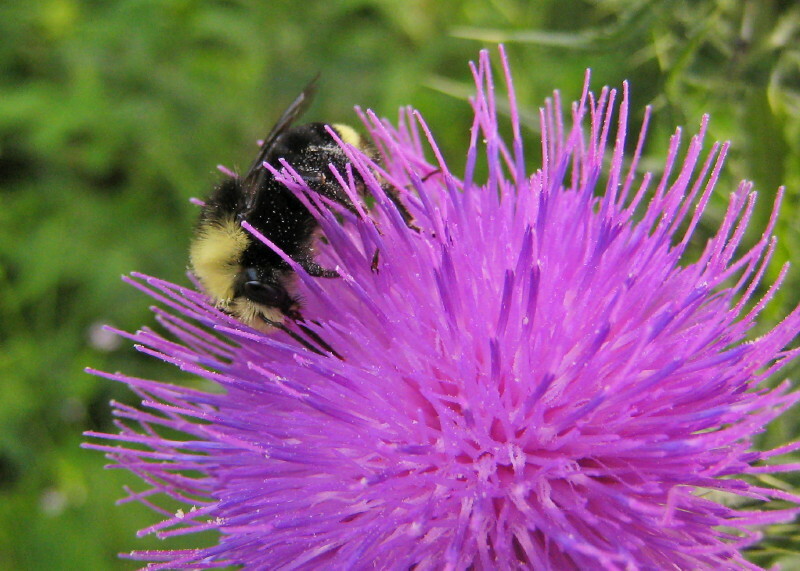 In June, food in the form of pollen and nectar is scarce. 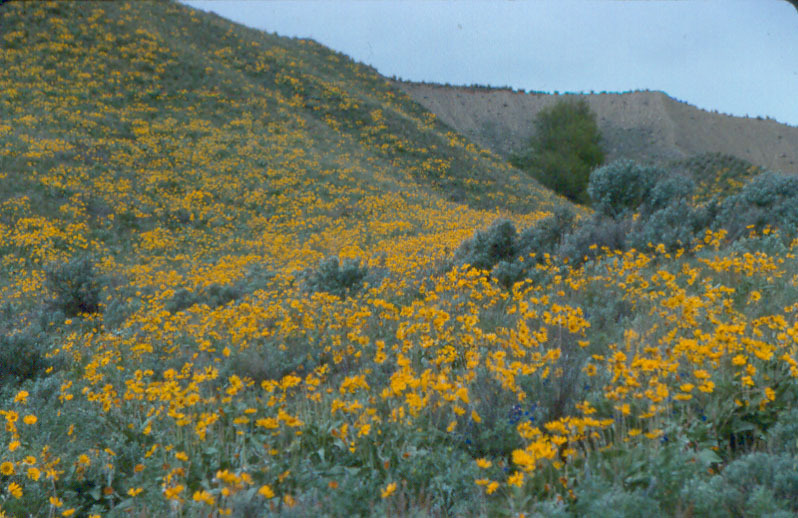 Early spring flowers have finished blooming and summer flowers are still developing. 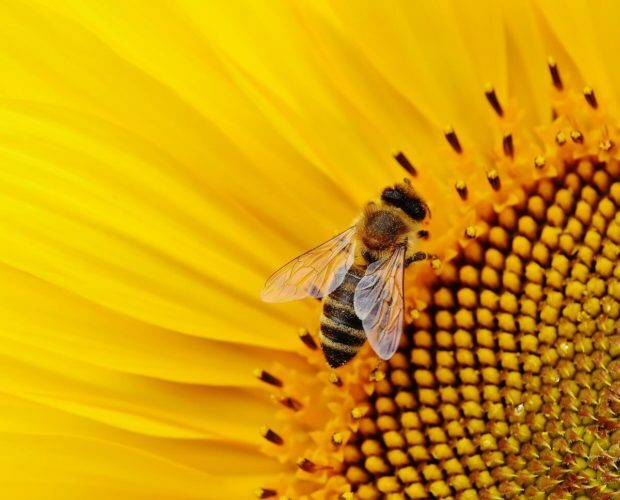 Therefore, June is normally a very difficult period for mason bees to survive and not starve since they do not store honey( unlike the honey bees). Thus, surviving through to July is quite the miracle! the surviving mason bees are now again in a bountiful period, when blackberry, fireweed and other summer flowers produce lots of pollen and nectar. Stephen D. writes- I’m on a steep learning curve, what with 3 types of bees. I created havoc with my mason bees, having to move the nests several times. A few bees managed to find a home, many more took off. I believe you wrote about this, so I was prepared. Nests are now in place permanently. Thanks for the great service you provide. 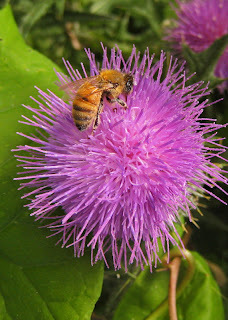 My question, is there a plant or plants that flowers at this time, that are favored by bees? I have Japonica, heather and Siberian Bugloss. They are now out of bloom, as are wild blue bells. Please suggest some options. I would opt for perennial with low growing habit. Also, do I put my leaf cutter cocoons out after a period of 20 degree C weather? Is there a recommended period? You will get a variety of blogs about plants. the local bees tell you which plants are bee attractive plants.